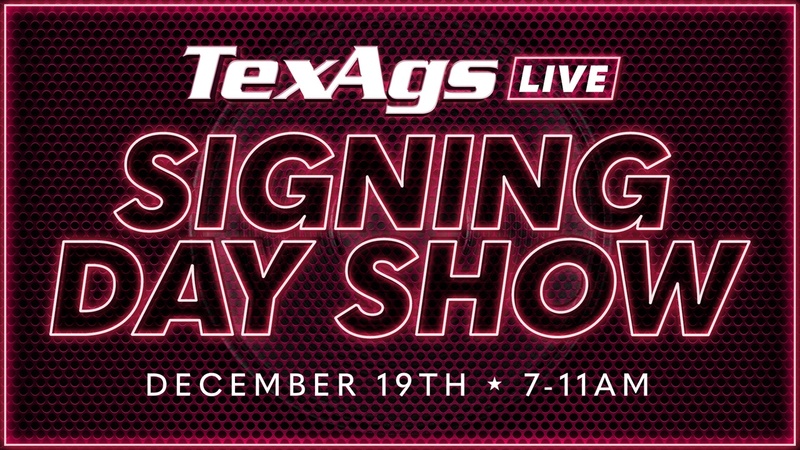 We're excited to join you LIVE for four hours on Wednesday, December 19th for the TexAgs Early Signing Day Show. Beginning at 7 a.m., Billy Liucci, Ryan Brauninger and the TexAgs recruiting team will join me and special guests as we break down Texas A&M's 2019 recruiting class. Our live production will be available to Premium and Varsity level subscribers, who can watch the show live on Wednesday, December 19 – with an exclusive commercial-free hour starting at 7 a.m. – at TexAgs.com/LIVE. If you've never tried TexAgs Premium and are interested in watching the show, you can click here to sign up for a $3 trial. As always, we're looking forward to the TexAgs Signing Day Show and are eager to break down what is sure to be quite an interesting – and hopefully exciting – day in Aggieland!